The International System of Units (SI from the French Le Système International d’Unités) is the universally accepted method of expressing physical measurements for world commerce, industry, and science. Though officially established in 1960, the origins of the present SI can be traced back to the creation of the decimal Metric System during the French Revolution. The SI has proven to be a living, evolving system, changing as new knowledge and measurement needs arise, and once again international consensus is building to advance the SI to reflect contemporary understanding of the physical world. 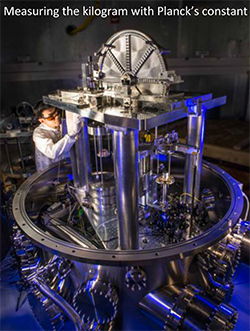 The new framework of the future SI will no longer be based on definitions of units such as the meter, kilogram, and second. Instead it will adopt exact values for seven fundamental constants of nature upon which all SI units will be realized. Gone are the base units and their definitions. A brief history of measuring nature will be presented, with emphasis on the formation of the metric system and the SI. A simplistic method for constructing a system of units will be described to contrast the present and future foundations of the SI. The impact and consequences of the shift to a system of units based on exact values of fundamental constants will be highlighted along with the timeline for the possible redefinition of the SI in 2018. DAVID NEWELL received his B.S. in Physics and B.A. in mathematics from the University of Washington and his Ph. D. in Physics from the University of Colorado. He was awarded a NRC post-doctoral fellowship to work on the NIST watt balance project in Gaithersburg, MD, and became a full time staff member in 1996. He has received the NIST Stratton Award for his contribution to reducing the uncertainty on Planck’s constant by a factor of 7, the Department of Commerce Silver Medal for innovations in traceable nanoNewton level force measurements and the Department of Commerce Gold Medal for a landmark measurement of the Planck constant leading toward a new definition of the SI. He joined the CODATA Task Group on Fundamental Constants in 2006 and participated in the 2006 and 2010 adjustment of the fundamental constants. He is currently preparing for the 2014 adjustment of the fundamental constants and working with a NIST team to construct a new watt balance to realize the kilogram from a fixed value of the Planck constant. 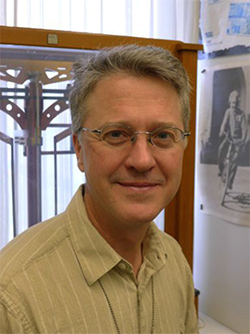 He is a member of the American Physical Society and chair of the CODATA Task Group on Fundamental constants. President Larry Millstein called the 2339th meeting of the Society to order on November 21, 2014 at 8:05 p.m. He announced the order of business and welcomed new members to the Society. The previous meeting's minutes were read and approved. The President then presented a summary of the 14th meeting of the Society on November 4, 1871, in which new officers were elected. From the 15th meeting on November 18, 1871, he presented President Henry's address on the establishment of the Society and the use of the word "philosophical" in its name. President Millstein then introduced the speaker for the evening, David Newell, of the Fundamental Constants Data Center of the National Institute of Standards and Technology. His lecture was entitled "Defining Fundamental Constants of Nature: the New SI." Dr. Newell began his lecture by noting that humans have been engaged in measurement activities ever since the dawn of the species, and that agriculture and commerce required a system of weights and measures. Advancements in technology, such as electricity, required new measurement techniques, and industrial growth spurred the development of standards for the purpose of systems compatibility. Dr. Newell then discussed the desire for universal measures. He noted that in 1668, John Wilkins proposed a decimal system based on time as the universal measure. In 1670, Gabriel Mouton suggested another decimal system with length as the universal measure. This eventually led to the metric system. In 1875, the first international system was adopted, entitled Le Système International d'Unités, or SI for short. SI now uses seven base units. Dr. Newell said many scientists had pointed out that, instead of measurements based on "standard objects," physical processes could be used to define units. For instance, Maxwell noted that molecular wavelengths, vibration, and mass could be used to define length, time, and mass, and Planck noted that the Planck and Boltzmann constants could be used to establish a system of units of length, mass, time, and temperature. Dr. Newell then pointed out that fundamental constants appear as parameters in the basic laws of physics. Some examples are the gravitational constant, c in Einstein's equation of general relativity, and h in Planck's law of blackbody radiation. Scientists perform measurements to deduce the value of constants and derive standard units from the results. The same constant can be obtained from measurements based on several laws and independent results can then be correlated. Over time, measurements of fundamental constants have become more precise. Dr. Newell next discussed the current paradigm for developing a system of units: start with quantities and the laws that relate to them, then choose base quantities, and then define everything else in terms of those base quantities. For example, in a system that covers acceleration, velocity, and force, one could choose mass, length, and time as the base quantities. Then one would choose a reference quantity to define a standard unit for each base quantity, such as one meter for length. Then these would be used to calculate the fundamental constants. But the New SI involves a fundamental paradigm shift. With the New SI, fundamental constants will be defined as exact values, and physical laws will be used to define unit reference values. The old SI was built on defined base units. The New SI will be built on defined fundamental constants. Dr. Newell listed some advantages of this approach. Reference objects, such as the International Prototype for the Kilogram, will no longer be needed. This will eliminate several problems, such as the lack of accessibility to the physical object and its value drift over time. With the new approach it will be possible to scale measurements by orders of magnitude without accumulating a higher level of uncertainty. This will improve the precision and ease through which widely varying units of measurement will be disseminated. Similarly, energy conversions will be precise since there will be no more uncertainty in the constants. With the New SI, some values that are currently exact will be defined operationally. As an example, Dr. Newell described the Watt balance developed by NIST for making extremely precise measurements of mass based on current and voltage. He also showed a time-lapse video of the long process of assembling the balance. Dr. Newell also described changes to the electrical standards of voltage and resistance, based on the Josephson effect and the Quantum Hall effect. He noted that all of these changes will be of fundamental significance to industry. He emphasized that to the general public there will be no perceptible change. And he concluded by noting that NIST is preparing a website to provide information on the New SI to the public. After the question and answer period, President Millstein thanked the speaker, made the usual housekeeping announcements and invited guests to join the Society. At 9:48 p.m., President Millstein adjourned the 2339th meeting of the Society to the social hour.